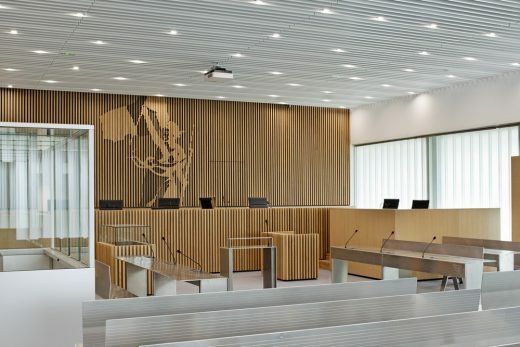 The law courts of Caen redefines a new domain of urban planning in the centre of the City. 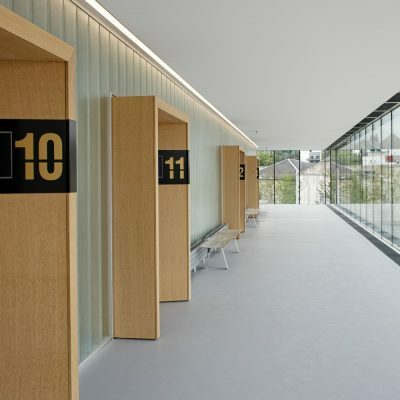 The original design from the office of Christian Hauvette& associés was revised by Baumschlager Eberle Architectes together with the Atelier Pierre Champenois a former partner of Christian Hauvette. It comes with a simple geometry which comprises several duties and responsibilities: the cube underlines the importance of jurisdiction by the means of its architectural form. The fundamental necessity of justice and the elementary methods of architecture correspond with each other as is the long tradition in Europe. The cube also clearly reflects its location and surroundings. The building and its public spaces constitute a self-confident district within an area which is under development. An orthogonal pattern constitutes the base for the internal organisation of the law courts. The main rooms are adjacent to the facades; the corridors throughout the building always terminate at the facades. This results in good lighting and comfortable working areas. But this pattern involves more than a pragmatic and optimized organisation of the building – it involves an experience of interior space. The circular centre spans all 5 floors; it is the heart of the law courts, a landmark and also a parameter for the interior area. A horizontal band highlights the first floor where the court rooms are located. 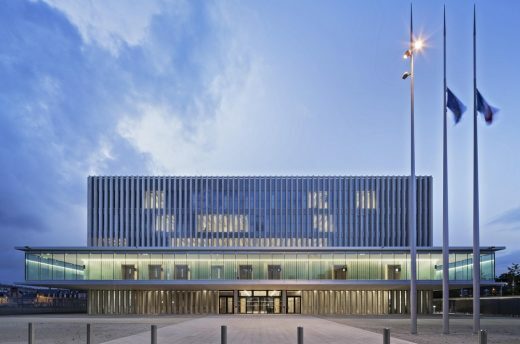 In so doing, the new law courts of Caen in Northern France communicate a message both to its users and to pedestrians: transparency, stringent shape and essential architectural means. Therefore it is not so far away from what a European civilisation expects from jurisdiction. But our civilisation today expects even more from a building – it should simply add to the longevity of our world. The buildings sustainable strategy is driven by two axis: the project offers both high comfort to the users and optimal energy performance. 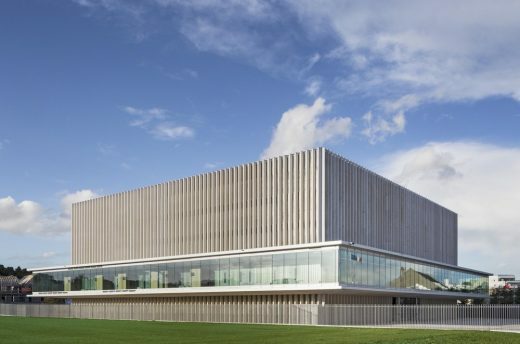 The passive and active strategies ensure the building achieves low energy consumption: a very compact volume, a double skin façade system and a bioclimatic atrium which helps to reduce heat loss while increasing thermal inertia. 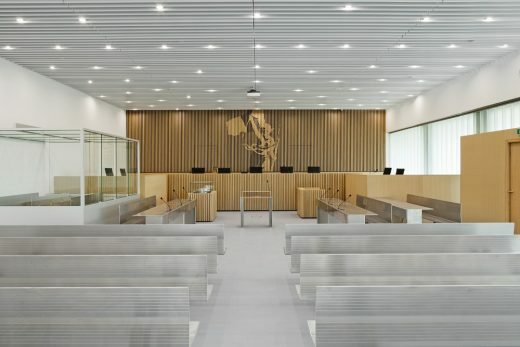 This project is part of the Ministry of Justice’s goals to provide the courts a contemporary environment, corresponding to the current requirements of functionality, safety and serenity, while providing optimal public reception conditions. Concerning urbanistic planning, the law courts of Caen redefines a new domain in the centre of the City. The design of BE Hauvette Paris and Atelier d’Architecture Pierre Champenois for this public building was recently presented to the public. It comes with a quadratic shape which comprises several duties and responsibilities: The cube underlines by its form the importance of jurisdiction by the means of architecture. The fundamental necessity of justice and the elementary methods of architecture correspond with each other as is a long tradition in Europe. The cube also puts an accent very clearly to the location where it is placed and the surrounding. The building constitutes with its public areas a self-confident district within an area which is under development now. The shape of the building agrees not only with the tradition but of course with the more complex duties of law courts in the 21st century. An orthogonal pattern constitutes the base for the organisation of the needs of the law courts. The main rooms are adjacent to the facades; the corridors throughout the building always end at the facades. This results in good lighting, and a comfortable working area is provided. But this pattern involves more than a pragmatic and optimized organisation of the building – it involves an experience of interior space. From the main entrance, there is an axis leading directly to the middle of the building. 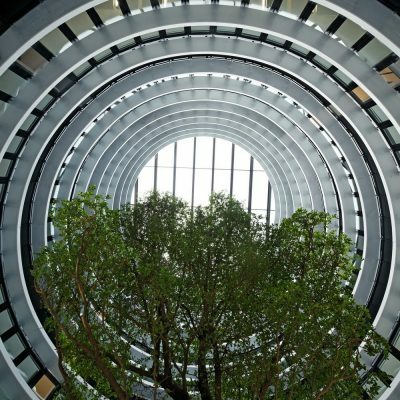 This circular center spans all 5 floors; it is the heart of the law courts, a landmark and also a parameter for the interior area. A horizontal pendant to this vertical elevation depicts the first floor where the court rooms are positioned. 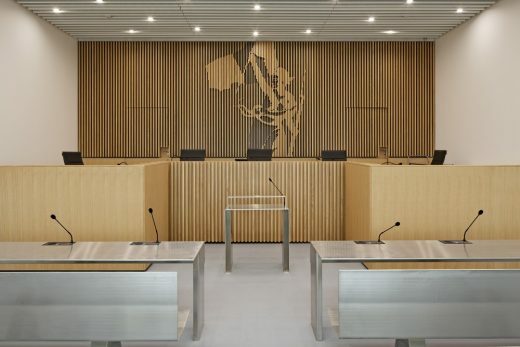 The floor accommodates the two storey high court rooms but it is also surrounded by an external and comfortable layer for the attending audience of the court. This layer is completely glazed and provides a direct view to the entrances of the interior court rooms. At night it seems this public area is floating above the ground, at day the prominence of this storey is also accented by the interruption of the facades. 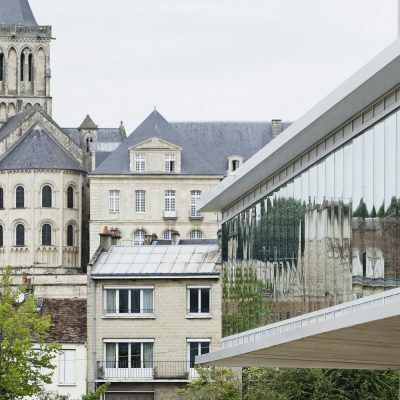 In so doing, the new law courts of Caen in Northern France communicate a message to its users and passer-byes: It is the message of transparency, of a stringent shape and essential architectural means. Therefore it is not so far away from what a European civilisation expects from jurisdiction. But our civilisation today expects even more from a building – it should simply add to the longevity of our world. 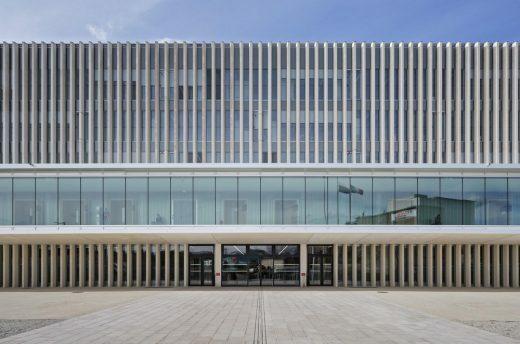 The buildings sustainable strategy at Caen is driven by two axis: the project offers both high comfort to the users and optimal energy performance. The passive and active strategies ensure the building to achieve low energy consumption: a very compact volume, a doubleskin façade system and a bioclimatic atrium helps to reduce heat loss while increasing thermal inertia; geothermal heat pump brings both heating and cooling by using renewable energy. Materials were selected for their sanitary qualities and low impact on the environment. 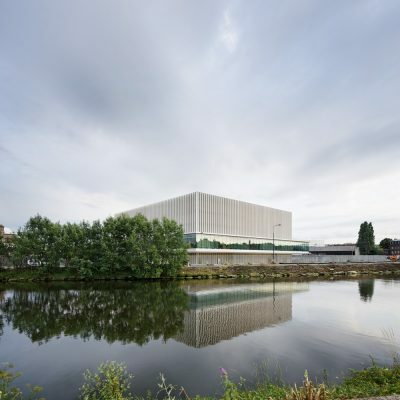 Rainwater harvesting, natural ventilation of the waiting hall and a global bioclimatic conception are many elements which will help the building to reach this sustainable challenge. The law courts’ construction will start in the third quarter of 2013, and will be completed by the third quarter of 2015. Le futur palais de Justice se situe sur la presque île de Caen, au cœur de la ville. Le projet dessiné par BE Hauvette et l’Atelier d’Architecture Pierre Champenois exprime avant tout l’importance de l’institution. 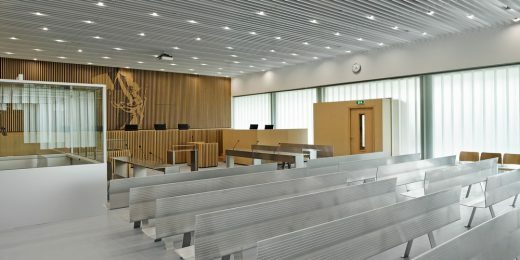 Architecture et Justice se rencontrent ici dans leur élémentarité : sa géométrie simple pour l’une et son rôle essentiel à l’égard de la société pour l’autre. L’implantation du bâtiment met en valeur son environnement proche et contribue à créer un espace public protégé au sein d’une zone en mutation. Si les façades constituées d’une série régulière de poteaux en béton blanc marquent la solennité de cette institution ; la salle des pas perdus introduit quant à elle, une césure tant structurelle que symbolique et, à travers la vue panoramique sur la ville de Caen et de ses monuments, donne à voir l’image d’une Justice ouverte et accueillante, proche des citoyens. 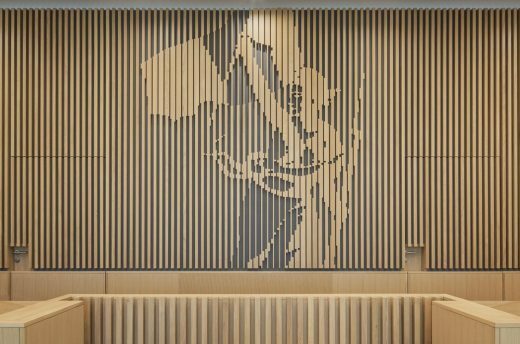 L’activité publique du palais ainsi mise en lumière devient l’emblème du projet, et exprime les valeurs démocratiques de la Justice. A ce parti architectural résolument contemporain, s’associent les enjeux du développement durable afin de conjuguer confort des utilisateurs et performance énergétique. C’est par une double stratégie passive et active que le projet s’assure de faibles consommations : une géométrie très compacte, une façade en double peau et un atrium bioclimatique permettent de réduire les déperditions tout en augmentant l’inertie thermique du bâtiment ; une pompe à chaleur à géothermie sur nappe d’eau souterraine offre le chauffage et le rafraîchissement par des énergies renouvelables. Les matériaux utilisés ont été sélectionnés notamment pour leur qualité sanitaire et leur entretien à faible impact environnemental. La récupération des eaux de pluie, la ventilation naturelle de la salle des pas perdus et plus généralement la conception bioclimatique sont autant d’éléments qui permettront de répondre à ces enjeux d’importance. 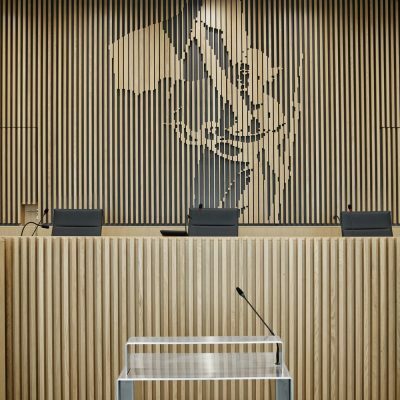 Ainsi, ce projet s’inscrit dans les objectifs du Ministère de la Justice de mettre à la disposition des juridictions un outil de travail contemporain performant répondant aux exigences actuelles de fonctionnalité, de sûreté et de sérénité tout en offrant des conditions d’accueil du public optimales. La construction du futur palais de justice démarrera au troisième trimestre 2013 pour une mise en service au 3ème trimestre 2015.